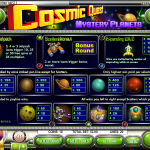 Cosmic Quest 2: Mystery Planets is a 5 reels / 20 paylines slot game released in 2009 by Rival. It is the second and last part in the Cosmic Quest saga by Rival. The first part was called Mission Control and in this one you go deeper and deeper into space and explore new planets. The Wild in this game is the Space Rocket symbol which will substitute other symbol to create a winning combination. It is also an expanding wild and all wins will multiply according to the number of wilds on the reels. There are also two scatters here. The first one is the Jackpot Jetpack symbol. 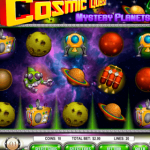 Landing 3, 4 or 5 anywhere on the reels will reward you with 10, 20 and 50 Free Spins respectively with a 2x multiplier. The second scatter is the Scatterstronaut symbol. Landing 3 or more will trigger the Bonus Round in which fly a spaceship in deep space avoiding obstacles. If you manage to do that you will get a nice prize. This is the second and also the better part of the Cosmic Quest Saga. The bonus features here are better and also the graphics looks a lot better. The RTP is average at 95% and overall you should give it a try. You will have fun! 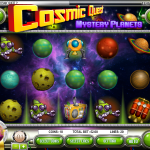 If you liked this one then you should really try its first episode Cosmic Quest 1 a 5 reel slot by Rival.